If you want to start winning matches you’ve been losing, feel better about yourself, and combine your nice strokes with intelligent tactical play (without spending dozens of hours on court and lots of money on tennis lessons), then you’ve discovered the way. My name is Tomaz Mencinger. I have been a tennis pro (USPTR Professional) and an expert tennis player for over 15 years. I am not a copywriter, but I want to share something with you that will help you play better tennis and win more matches, regardless of your tennis skills. When I started playing tennis at the age of 15, I had no one to coach me. I learned by watching TV, by using my VCR to observe and analyze Andre Agassi's forehand in slow motion, and by relentless practicing in front of the mirror. Then I hit the courts and tried to practice the strokes while hitting with my friends. Since the talent was there from other sports, I quickly developed very good technique. I then felt ready to play in tournaments and various leagues around my country. My pretty strokes were useless. On the other side of the net were players twice or three times my age with funny looking strokes and big bellies, totally unfit. I felt like a yoyo yanked from side to side, back and forth. Before I realized what was happening it was over. My opponent shook hands with a slight sly smile, probably thinking: »Another one who doesn't know what tennis is all about…«. Here I was, giving my best effort, working hard, playing good »looking« tennis, and yet I was out of the tournament in the first round with a humiliating score. The answers gradually appeared in my mind. I realized that beneath the outer game of tennis there is another game — the strategic and tactical one to outsmart your opponent. I realized that strokes are just the tools of achieving something else — winning the match with smarter play. And soon after this realization something else happened! I started winning more and more matches! Same strokes, same abilities, different thinking, smarter play, better analysis of my opponent, and increasing belief in myself — it all translated into winning most matches I played against players at my level. This journey continued for 15 years. I played; I coached players from club level to national ranking; and I continued to study tennis strategy. "Start Winning Against Players You've Never Beaten Before!" This is an ebook in Adobe PDF format that you can immediately download to your computer. It is truly an encyclopedia of tennis strategies and tactics for every level of play, whether you are a beginner or an expert tennis player. Actually as you will discover expert players base most of their game on very simple tactics that are suitable even for beginners. And only on top of those basic patterns they choose more advanced and expert tactical combinations. So the encyclopedia teaches players of every level how to play better tennis and use their potential to the maximum. »Very cool. This ebook helped my game a lot. I now know how to play even the most difficult opponents and find their weaknesses. Then what can you learn from it? The 4 basic tennis laws — the foundation of tennis (If you don’t know them, you are sending your opponent a gift every few points. The first one is the simplest but isn’t used enough. Crosscourt or down the line? Which direction? When? What to do with your second serve even if your opponent has good strokes on both sides? You'll then see how to apply those 6 general strategies to all 5 game-playing situations: when serving, when returning serve, when both players are at the baseline, when playing at the net, and when hitting a passing shot or lob. This gives you 30 situations that you can practice. Imagine being at least proficient with them. Could anyone then predict how you are going to play the next point? "Hi Tomaz, I read your ebook on Tennis Strategy with great interest. I have played for 26 years on various teams and also in small local tournaments. I have read many different books on the subject but have never encountered something as complete as this. Particularly, valuable is how you give readers specific summaries of what to do in certain situations. There were many eye-opening strategies that I had never ever heard about. Most impressive was your analysis of professional tennis matches in which you trace out exactly how even the very best players rely on basic strategies to win points. I even went to youtube and verified it for myself. Your analysis was right on the mark. I also want to point out that your willingness to answer emails directly makes this offer cheaper than anything on the market. I highly recommend this book to anyone who wants to learn about the X's and O's of tennis. One last thing, I implemented many of these strategies on the court with great success! Learn the basic tennis tactics that Roger Federer and Andre Agassi used 64% of the time in their 2005 US Open final. After learning basic, advanced and expert tennis tactics you'll have the opportunity to view a detailed statistical analysis of the Agassi-Federer match, where EVERY shot they played fits into one of these 3 categories. For example, you'll be able to see how many of their returns were played in a basic way, how many were played in an advanced way, and how many were played in an expert way. This reveals the foundation of their game and how they build on it with advanced and expert types of play. "This was a refreshing read - not about someone's "correct" way to hit a tennis ball, but rather how to think about what tennis shots to hit, and why good choices will help you win. This book is going in my tennis bag!" But wait, that’s only the FIRST PART of The Strategy Encyclopedia! And all those tactics in it work regardless of the type of player you are facing! You probably know what type of opponent is your Achilles heel. There are just some players who aren’t very good, yet you regularly lose to them. Somehow, their game really hurts your way of playing. And your confidence too, right? There are 4 typical player game-types: the counter-puncher, the aggressive baseliner, the serve-and-volleyer, and the all-court player. Since any type of player can play against any type of opponent, this translates to 16 adaptations of these four main strategies. Likewise for the other 3 game types: for each you'll get a detailed tactical and mental plan for how to approach a match against each type of player. Since both of you may have a good tactical plan, the game may not depend on who plays a smarter game but on who EXECUTES their game better. To win that battle you need the right mindset. That’s where the two mental battles come in. One is the battle with your own mind, which might lead you toward goals other than winning the match. The other mental battle is with your opponent. Maybe it’s a battle of patience or a battle to be immune to errors or something like that. It’s a battle within the battle. While you execute your tactical patterns, you also compete with your opponent on a different level. And if you lose the mental battle, then your tactical plan is gone, too. That’s why the tactical battle is only a part of the story. You also need to be mentally tough to get through all the troubles and setbacks you will inevitably meet in high quality tennis matches. “The e-book is really good for players and coaches alike. It gives you an in depth information on how to effectively use your strongest weapon - your head! I guarantee you will improve your game in different ways after reading the e-book. You’ve now mastered playing excellent tactical tennis, whether that means playing smart in general or playing against a specific type of player. You now need to consider other factors that determine the outcome of a match and go even deeper in understanding how we make decisions during a ball exchange, how intuition helps us play better and more effectively. That’s what PART III of The Tennis Strategy Encyclopedia will show you. How to play on grass (if you happen to get the chance) so that you take advantage of every characteristic of grass courts (like the low, fast and unpredictable bounces), and how the ball behaves when hit flat, with slice or with topspin. Playing in the wind — how to adapt your targets and strokes for consistency in those annoying conditions, how to play with the wind in your face, and how to take advantage of a wind at your back. Winning against a better player — what 3 attributes distinguish good players from those who are merely good hitters. Discover how this information helps you devise your winning tactic against them. You’ll learn what kind of shots it’s best to avoid against good players, how to find their weaknesses, and how to stay positive and fight until you win, even when the match seems lost. There are even more strategies in the Encyclopedia! What are tactical decisions and what is the secret to making quick and correct decisions during the brief time you have while the ball is coming? What is the hidden part in the tennis strategy of the best all-court players like Martina Hingis and Roger Federer — the part that enables them to play statistically high-percentage tennis and yet surprise their opponent with the most cunning and unpredictable shots and combinations? You’ll of course also learn how to develop this in your game (and mind) to make you a great tactical player, too! Last, but not least, you’ll learn how to apply all this information from the Strategy Encyclopedia in a step-by-step manner, so that you don’t feel overwhelmed by the amount of information you absorbed during your study of all these strategies and tactics. "In The Tennis Strategy Encyclopedia, Tomaz Mencinger tells us to accept reality in tennis and in life. He tells us what to work on in terms of strategy and tactics. What to do, why to do it, and how to do it. He even tells us what we can do now and what we might do as we improve. Tomaz, like a chess teacher, doesn't talk down to us, but instead shows how a real master can explain things in a simple way. As always, he says good things in an interesting way, so that we can enjoy our education. Tomaz, thank you for sharing your wit and wisdom with me." There are four main strategies and, for each, four modified strategies, one for each type of opponent. So all together, there are 16 adaptations of four main strategies. For every variation you will discover the keys to winning the tactical and the mental battle that goes on in the match. All right, this seems like a lot of expert info! How much is all that worth to you? Let’s see by comparing the cost of The Tennis Strategy Encyclopedia to the cost of the other ways you can learn strategy. One way is by watching matches on TV or live and studying them. This may not cost you much money, but it does take a LOT of time to understand what is going on, since no one will explain it to you. Another way is by taking lessons. A typical lesson costs between $30 and $60. If a coach just quickly read the book to you, it would take him around 10 hours. Multiply that by $45 (the median price of a lesson) and it would cost you $450 just to listen to all the information once. But since you can get this ebook immediately with a download, and since I want you to win more and reach the level of play you are capable of, your total investment for the Tennis Strategy Encyclopedia ebook is only $27. This is what most good USPTA or PTR certified coaches charge for a 30 minute practice. Why such a low price for a 100-page ebook with all this detailed knowledge on tennis strategies and tactics? Now think about it — which option will help you improve more: a 30-minute practice on court or the wealth of information from the 38,000 words in the Tennis Strategy Encyclopedia? And remember — once your practice on court is over, you have to pay again for the next session. But once you get this ebook, you can return to it even years after your investment, since you’ll still have it. "Tomaz clearly brings the wisdom of top coaches to the masses. His Tennis Strategy Encyclopedia will have you re-tooling your game for peak performance the day you read it. No question that he details proven approaches to the game that will work for you." Three email answers from me about anything related to tennis, whether that’s strategy, the mental game or technique. That’s a $25 value. Buy with confidence from Clickbank, the authorized retailer of The Tennis Strategy Encyclopedia, where your transaction will be handled by a secure server. Clickbank currently sells more than 10,000 digital products online, and the number is growing daily. 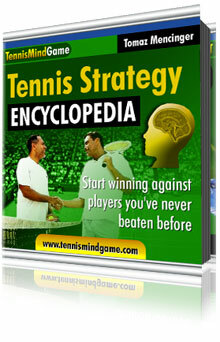 Give the Tennis Strategy Encyclopedia a good try and APPLY the information to your game. If after 90 days you still feel that the strategies and tactics from the ebook did not help you play better tennis and win more matches, then contact me and you will receive a full refund. Have just finished reading your e-book. It's quite superb. Your clear, concise writing style, combined with your wonderfully logical analysis of tennis strategy makes your work an absolute pleasure to read -- and re-read. But joking aside, please accept my sincerest congratulations for putting together such an *invaluable* resource for anybody interested in improving his (:-)) tennis game. Any player armed with the tennis knowledge that you impart will be a very difficult player to beat." You’ll get The Tennis Strategy Encyclopedia ebook, which you can immediately download. And you’ll complete your transaction with the trusted and secure Clickbank company. You can start playing smarter game and win more matches even if you read only one chapter of the ebook. Order now and finally realize why you were losing matches and what you can do to turn the tables. P.S. Remember, unless you do something about your game it will probably stay the same. You can have the ebook in the next 2 minutes and apply the strategies in the next match you play. That raises the chances of winning that match, doesn’t it? P.P.S. Your credit card is much more secure in the world of Internet transactions than at a restaurant where a waiter takes it somewhere behind the scenes and returns later with a receipt. Clickbank is one of the most trusted and used online merchants in the world and offers full protections from any credit card fraud possible. So don’t hesitate and finally find out “how to win matches” against players you have never beaten before!